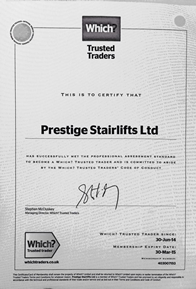 Prestige Stairlifts has successfully met the professional assessment standard to become a Which? Trusted Trader and now committed to abide by the Which? Trusted Traders Code of Conduct. We are extremely happy to have this endorsement as it is widely recognised and means we are constantly doing the right thing by our customers.